All metrics based on Web of Science-indexed journals can be access via Journal Citation Reports. In addition, Eigenfactor measures can be accessed on the Eigenfactor.org website. 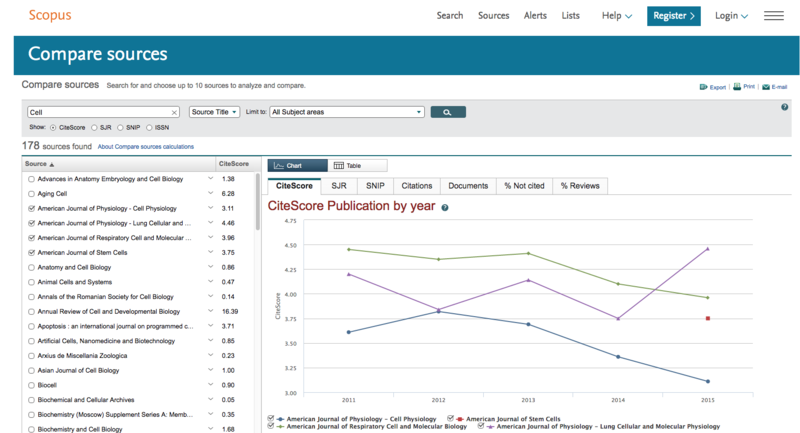 SCOPUS-based metrics can be accessed via SCOPUS platform as well as via JournalMetrics.com, CWTS Journal Indicators and Scimago (SJR indicator only) websites. Many publishers will also provide information about impact of their journals on the journal web pages. See below an example of an Elsevier title showing a number of relevant indicator. Because JIF values are not normalised for disciplines, it is very difficult to compare the IF values for journals in different disciplines. Moreover, the range of IF values vary widely from discipline to discipline, based on their citation behaviors. For instance, top medical journals would have IF of 50.00 and higher, while top titles in mathematics have IF of around 3.00. For that reason, a good alternative to citing the raw IF value is the information about a quartile position of the title. For instance, Journal of Women's Health, with IF of 2.050 places in Q1 in Women's Studies (2nd highest IF value out of 41 titles in the category) but in Q2 in Public, Environmental and Occupational Health (37th rank out of 147 titles in the category) subject categories. Immediacy Index is the average number of times an article is cited in the year it is published. It indicates how quickly articles in a journal are cited and is calculated by dividing the number of citations to articles published in a given year by the number of articles published in that year. Half-life indices show how quickly journals age (cited half-life) and how current is their content (citing half-life). Citing-half life of 5.1 for NEJM means that median age of references in 2014 issues of NEJM was 5.1. Cited half-life of 8.4 means that median age of all NEJM papers cited in 2014 was 8.4. Eigenfactor is another journal metrics calculated for Web of Science journal titles and available in JCR and Eigenfactor.org. It uses information from the entire citation network to measure the importance of each journal, much as Google's PageRank algorithm measures the importance of websites on the world wide web. Source Normalized Impact per Paper (SNIP) measures contextual citation impact by weighting citations based on the total number of citations in a subject field. As a field-normalized metric SNIP offers the ability to benchmark and compare journals from different subject areas. This is especially helpful to researchers publishing in multidisciplinary fields. SCImago Journal Rank (SJR) is a prestige metric based on the idea that 'all citations are not created equal'. With SJR, the subject field, quality and reputation of the journal have a direct effect on the value of a citation. 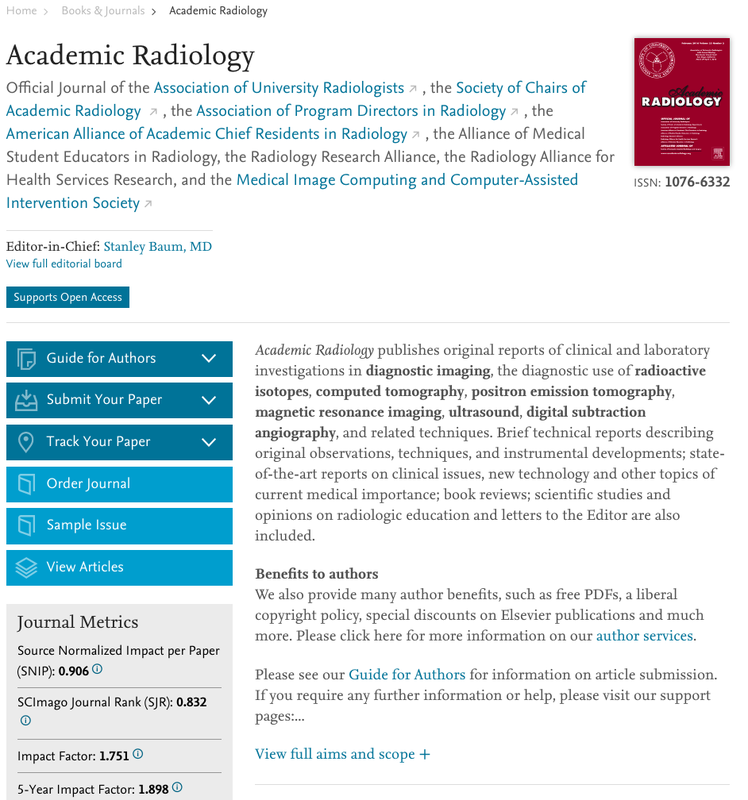 It is a size-independent indicator and it ranks journals by their 'average prestige per article' and can be used for journal comparisons in the scientific evaluation process. CiteScore is Elsevier's answer to JIF. CiteScore for a journal in a given year counts the citations received in that year to documents published in three proceeding years and divides this by the number of documents published in that journal in the same 3-year period. Unlike JIF, document types used in numerator and denominator are the same and include research articles, reviews, conference proceedings, editorials, errata, letters and short surveys. Articles-in-press are not included in the calculation of CiteScore. See box below for more information about the sources of these journal metrics. 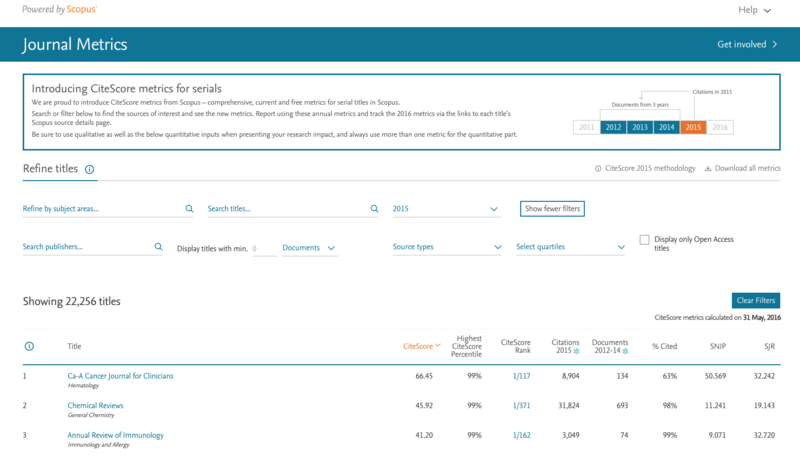 All three SCOUPS-based journal indicators can be found in SCOPUS' Journal Analyzer (subscription required). Freely accessible Journal Metrics website from Elsevier. Includes ability to download data underlying CiteScore calculations allowing end-user verification. 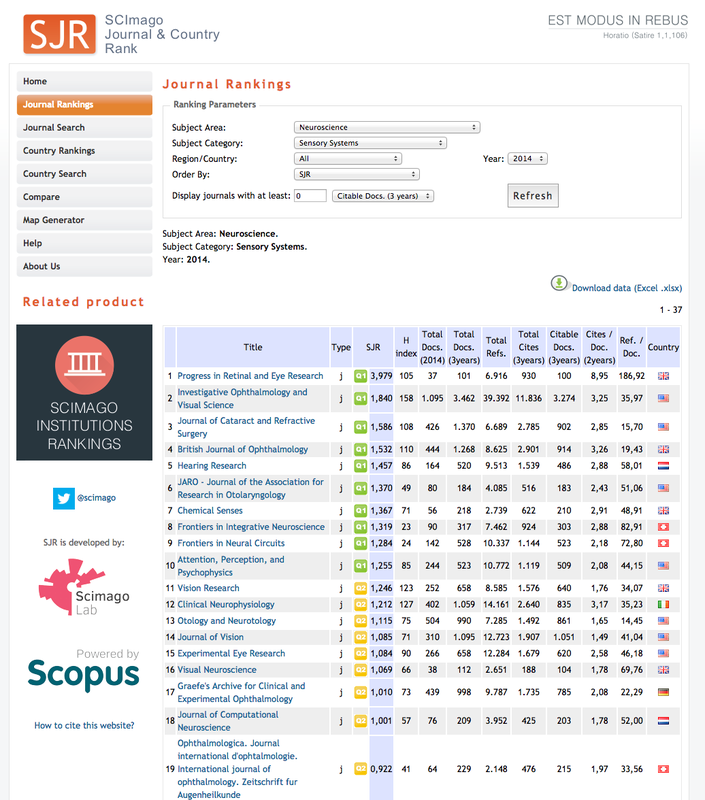 Scimago website from University of Granada provides SJR ranking of journals (as well as countries). Additional metrics provided by Scimago include journal h-index, total papers in current year and last three years, total references, total citations in last three years and the rations of citations to papers and references to papers. Example below shows Scimago (SJR) ranking for 2014 set of journals in Sensory Systems, sub-category in Neuroscience, as indexed in SCOPUS. 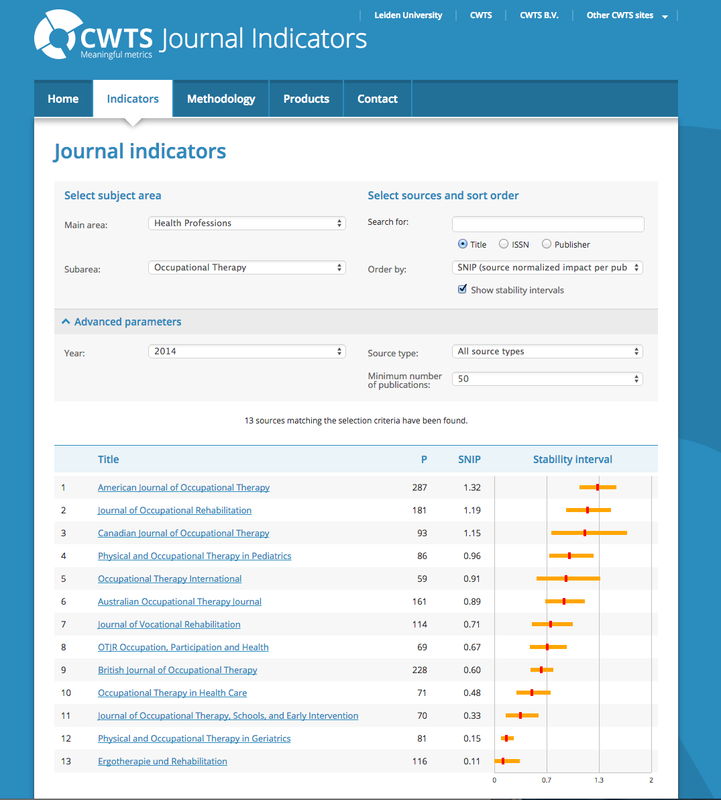 Another free source of SCOPUS-based journal metrics is CWTS' Journal Indicators page. It provides ranking for some 20,000 journals (indexed in SCOPUS) including SNIP, IPP, number of publication in a year and a percentage of journal self-citations. The screen shot below shows the 2014 SNIP ranking for 13 titles indexed by SCOPUS as Occupational Therapy. Google Scholar Metrics is another source of journal-level metrics. 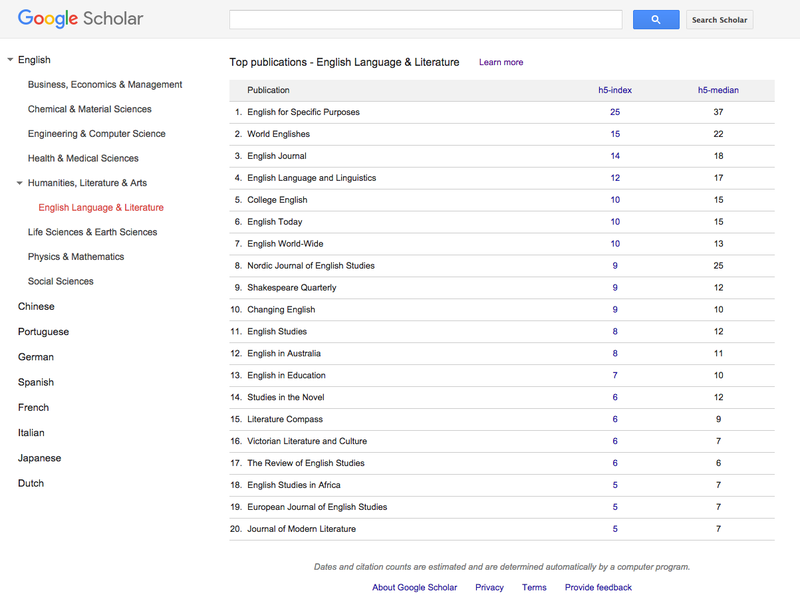 Based on Google Scholar citations it ranks journals grouped by subject categories or language. The metrics used are: h5-index defined as the h-index for articles published in the last 5 complete years. It is the largest number h such that h articles published in 2010-2014 have at least h citations each, and h5-median for a journal is the median number of citations for the articles that make up its h5-index. The screen shop below shows the Google Scholar ranking for English Language and Literature journals.